Planning on attending your first dog show? This field guide will help you to identify all of the various species you’ll find on or around the average show site. Bring field binoculars and a note book, and you and friend can compete to see who spots the most types. Professional Handlers (PHs) are those who show dogs for a fee, so the dogs’ owners are spared the joys of kneeling in the mud in their own business suit, or having their last pair of pantyhose split on the second day of a 10-day circuit. PHs can be discerned from other exhibitors by several methods. One is their somewhat officious and aloof manner around ringside (which is difficult to master when you have muddy knees and/or split pantyhose). Outside the ring, PHs rarely acknowledges anyone except the judge (whom they know personally), other PHs (whom they know personally), and their own kennel help (whom they either know rather too personally, or who are from foreign countries and have unpronounceable names, or both). Kennel help, by the way, are those nubile young men and women who race back and forth from the grooming area to ringside like orbiting comets, bringing dogs to their PH to show and taking already-been-shown dogs back to their crates in a never-ending cycle. This is called “learning the business”. Meanwhile, the PH stands there, dog less, squinting at the competition and deciding whether to get his or her armband the usual half-second before going into the ring, or give the steward a real shock and get it a whole minute ahead of time. PH plumage is the nicest seen among those at the dog show, besides that of the judges and the junior handlers (q.v. ), because the kennel help are the ones who do the dirty work outside the ring. PHs has no reliable call, but do sometimes change color abruptly in the ring when they don’t receive the award they expected. Generally leaving speedier in motion when leaving the ring than when they entered it. JHs may be confused, at first, with kennel help. However, this is only because of the similarity in age and intensity of the facial expression. The plumage is distinctly different. While kennel help are invariably in white grooming smocks with paw prints and clots of hair stuck to them, JHs are by far the most impeccably dressed people at the show; including the judges; the show chair and the AKC field representative (q.v.). The average JH looks like a recent appointee to the ambassadorship of Great Britain, and a whole class of them filing into the ring evokes images of an opening session of Congress, but more dignified. The JHs’ expression and demeanor is unique in the world of dogs: In the standing line-up, they stare intently down at their stacked dogs with a slight frown that says, “I’m very constipated, and so is my dog.” This effect is only interrupted by piercing glances up at the judge, at which point the expression changes instantaneously to a disconcerting and maniacal sort of rictus, which says, “All better!” This transformation is exaggerated even further when the judge has the JH gait the dog. The JH then goes into high gear, somehow running the dog around in a circle but never unpinning the judge from that death’s head grin. It is a skill worth watching, but weirdly reminiscent of the scene from The Exorcist when Linda Blair’s head creaks slowly around backward. Throughout the entire performance, their clothes never wrinkle. JHs are the only exhibitors who routinely congratulate each other on their wins, although it may be done through jaws clenched so tightly that one can almost see the child’s orthodonture shifting. JHs do not have a readily identifiable call, as custom forbids any audible reaction whatsoever. Noises are strictly the purview of the parents of the JH, who are at ringside. (They are the ones with the paw prints and clots of dog hair stuck to them.) These calls range from high-pitched screams of delight (when the child wins) to a sharp but hushed squawk of “Andrew! Bring that dog over here!” (When the child doesn’t win). OEs are quite distinctive in appearance from conformation handlers. Priding themselves on the fact that their dogs ‘have brains, not just looks’, the exhibitors dress for workmanlike practicality. Jeans or chinos with cotton shirts are popular on both the males and females of the species, with tough but comfortable shoes. The fancier plumage of the conformation ring is almost never seen. Oddly, OEs are not found in the area of the obedience rings before they are to be judged. Since they are not allowed to practice with their dogs on the show grounds, you will find most of them far from the rings, pacing seriously about like wind-up toys, dogs at heel. OEs have a peculiar, Groucho Marx-like carriage, reminiscent of someone who badly needs a back brace or is already in one. They execute turns with military precision, and they always come to a halt with their feet exactly together. Then they lean over stiffly and praise their dog in a mechanical manner. If the dog misbehaves, the OE may erupt in a sudden display of noise and violence, but then immediately returns to that grim pacing. It’s frightening. The more advanced OEs carry small baskets or pouches with them, full of dumbbells and gloves called ‘articles’. These are only handled with tongs and are guarded jealously lest anyone touch them. For all that, OEs as a group generally have affable temperament so long as one approaches them after they have shown their dog. (Not right afterwards — give them 15 minutes or so to get their blood pressure under control). They are known for their physical stamina (all that heeling), adaptability (practicing and showing in all kinds of weather, on all kinds of terrain), helpfulness (suggesting training solutions for your dog, which they’ve never worked with), mental stability (surviving every sort of embarrassment from their own dog in the ring), and big hearts (those with small hearts don’t survive their first 5-minute out-of-sight down stay). The only exception to this affability is the exhibitor competing for an OTCh. OTCh.-level competitors, like African Cape Buffalo, are dangerously unpredictable and should be left strictly alone. Judges are those official-looking officials in the middle of each ring. Their plumage is wildly variable but generally falls somewhere in the range of sporty to dressy, depending on the weather and the venue. At some of the fancier shows, plumage can become positively splendiferous, including sequins on both males and females. No matter what the attire, the infallible means of identification is the purple badge they wear. This badge is critical for the judges because it gets them free meals, free hotel rooms, free transportation and a check from the club treasurer at the end of the day. Conformation judges are usually seen in the middle of the ring with a line of dogs and handlers tearing around them in a circle, trying to look like they’re having fun. The judge scrutinizes them all with feet slightly spread (for balance), hands clasped behind the back or folded across the chest (to keep them out of the way), and eyes squinted (to look sagacious). Older judges have been known to fall asleep in this stance, so it behooves the first exhibitor in line to get clear instructions ahead of time as to when to stop running around the ring. The call of the conformation judge cannot usually be heard outside the ring as they are given only to short consultations with the exhibitor nearest at hand. Younger judges may be chattier than older judges. Some elderly judges have been known to reduce their instructions, over time, to a combination of grunting and pointing, which the exhibitor must then interpret and execute properly. It’s a skill. Obedience judges look like high school gym teachers sans the whistle. They tend to be more athletic than their conformation counterparts, as they must follow each exhibit around the ring as it performs the exercises. They carry a clipboard and a pencil everywhere with them, and they can be heard calling commands to the exhibitors, who in turn, command their dogs. This makes the obedience rings much more interesting to watch than the conformation rings, where everything seems more private and quite inexplicable from the outside (and sometimes from the inside). Because of all this activity, obedience judges’ plumage runs more to the practical/sporty side of the spectrum than the conformation judges’ do. Obedience judges are very particular about their rings, pacing them off, inspecting the ground for dog-distracting detritus, personally setting jump standards to their own satisfaction, and measuring everything in sight with their own personal tape measure (which they all carry), so as to make it fair for each competitor. Conformation judges, by comparison, have been known to lose half their entry in a ring crevasse and mark them all absent before noticing anything was wrong. 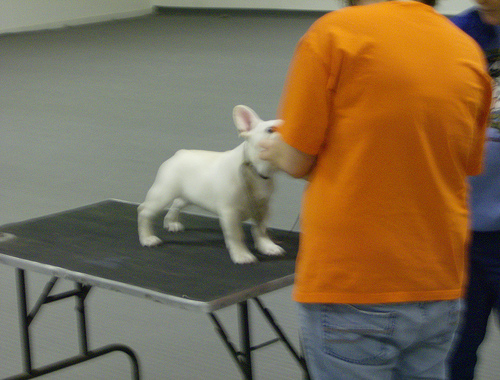 Obedience judges are also skilled at totting up entire score sheets of two-digit numbers in five seconds or less. The steward is the person sitting at the table by the ring gate who isn’t the judge and isn’t an exhibitor. As is the case in most walks of life, this most unobtrusive person, with the dullest plumage, is actually the one doing most of the work. The conformation ring steward hands out armbands to the exhibitors, lines up the exhibitors for the classes, arranges the ribbons and trophies on the table for the judge, and calls for clean up and for the photographer as needed. The obedience ring stewards perform all of the above, also stand as “posts” for the Figure-8 exercise, diddle about with gloves, and dumbbells for various retrieving exercises, adjust jumps, and generally see to it that the judge stays on time and the ring runs smoothly. Stewards dress strictly for practicality, as they have to work at the show all day. Indeed, on a rainy or cold day, the stewards may be the only people who seemed to have had common sense enough to wear boots or a proper coat, since everyone else is concerned with looking elegant. They generally carry a largish sort of bag with them, and this bag has every possible emergency item in it, from weights for holding down ribbons on a windy day, to an extra pair of socks, to a fully equipped first aid kit. The steward’s job is to be prepared for any eventuality, which might befall them, their judge, or their exhibitors, and the good ones are so prepared. Stewards have a distinctive call, and one of the most highly valued assets in a good steward is a loud voice. In the conformation rings, it consists of the announcement of a breed name and class, such as “Dalmatians! Puppy Dogs!” used to summon the entrants into the ring for judging. In obedience, they quietly call out the armband number. (They call quietly because obedience exhibitors are usually at ringside when it’s their turn, ready to go in. Conformation types are more likely to be carrying on some incredibly important conversation with someone and not paying attention to what class is in the ring). If an armband remains unclaimed, the steward will wave it overhead while shouting the number out. If an errant exhibitor has picked up the armband but has not reported to the ring for their class, the steward will shout out that number as well. Then he or she will fall silent, turn to the judge, and shrug. If ever the federal government wanted to fund a Stealth Dog Show Attendee, the AKC Field Representative, known as “the Rep”, would be it. Very difficult to spot in the field due to the fact that only one attends any given show, they tend to appear like phantasms and then just as suddenly melt back into the crowd and disappear. The really skilled ones can disappear from view at ju-u-u-st that precise moment when one’s eyes become focused on them, making one think one didn’t really see them at all. Because they are supposed to attend the show as the ambassador from the AKC to observe judges, answer questions, mediate disputes and calm the hysterical, they are rarely around when you need one. However, the Rep can most often be pinned down at the Superintendent’s tent or in the vicinity of whatever club facility houses the public address system. When on stealth duty, they sit decorously at ringside, pretending to chat discreetly with a friend while actually observing the judge. After said judge notices that the Rep is watching, and has passed at least one quart of nervous perspiration, the Rep jots a few notes, smiles mysteriously, picks up his or her chair, and silently moves on to a new quarry. AKC Reps look like adult JHs — impeccably dressed, shod and coiffed, but sometimes with the additional ‘je ne sais quoi’ of a hat. Hatted male Reps seem to go for the tweedy-English-country-gentleman look, while female Reps often favor swoopy, broad-brimmed confections, which may involve feathers. Both male and female Reps have that certain uppercrust-y aloofness, which surrounds all those who wield a lot of power. This above-it-all aura acts as a natural repellent to dirt, dog hair and most people, and allows the Reps to attend multiple dog shows in their best attire, in all kinds of weather, without getting so much as a micron of dust or a whisper of calumny on themselves. Superintendent’s Staff: The superintendent’s staff falls into two categories — those in fancy plumage who attend to the administrative work of the show, and those in working attire who do the roustabouts’ job of driving the big trucks in with the supplies and setting up the rings and tents. The roustabout types show up the previous evening to set up. This is usually a crew of six or so burly men who only need to know where you want everything placed to have it up and done in a twinkling. It’s a fascinating process to watch — just like Barnum and Bailey, but without the inconvenience of elephants. Canny grounds chairmen know that any special favors they may wish can be effectively accomplished through the liberal application of beer. At the end of the show, the crew has the rings and tents down, folded and loaded in no time, and the truck is often rolling off the grounds before the Best in Show winner is back in its crate. The administrative superintendent’s staff is found in the superintendent’s tent. They sit there, behind a high counter-like structure, writing things (no one is sure what) and looking annoyed if someone interrupts them with a request. Periodically, they make dashes to the rings to collect judges’ books. Then they return to their counter and write some more. There are other people at the dog shows, but you’re not as likely to see them around the rings because they’re too busy working on show day. These people include the show chairman, the hospitality staff, the officers of the club, the catalog chairman and the parking people (you saw them when you came in). All these people have important jobs to do before, during, and/or after the show. Any exhausted-looking person in casual (maybe even dirty and sweaty) clothes, stumbling about, mumbling under his or her breath, is undoubtedly one of these and should not be arrested as a vagrant. They deserve a smile and a thank-you, because they, as well as those mentioned above, make it all happen every year for their club, and the exhibitors and spectators who attend their dog show. 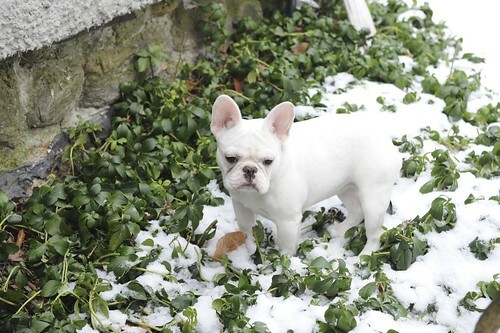 French Bulldogs have always been a popular ‘second breed’ for breeders and exhibitors. Downsizing from Mastiffs or even Bulldogs to something more compact makes sense – easier to carry, easier to show, less room required. What has come as a shock to many of these transitioning exhibitors is how downright nasty the French Bulldog ring can be from time to time. Oh, don’t get me wrong — all rings are competitive, that’s a given. Everyone showing on any given day is there because they expect to win – it’s just that, in the Frenchie ring, we seem to have more than our fair share of people who don’t take losing with anything approaching grace. In fact, there’s an awful lot of similarity between some losing Frenchie exhibitors and a spoiled, tantrum throwing seven year old who’s just been told that the party is all out of chocolate ice cream.